A new lesson, entitled “Population Drift: Mean Center Analysis 1790-2010” in the ArcLessons library (search on Population Drift), invites students to use spatial analysis, spatial statistics, and GIS to determine and analyze the population centers of the USA and individual states over space and time, from 1790 to 2010. This lesson was recently updated to include 110 in-depth questions, a very rich set of data including the new 2010 county population figures, and to use the powerful spatial statistics tools in ArcGIS 10. 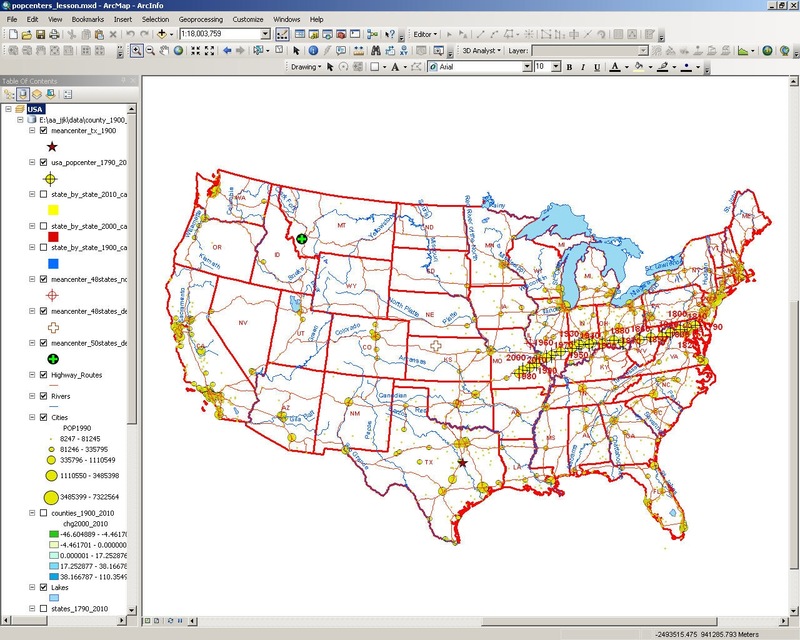 The objectives of this lesson are to 1) Understand the definition of and application of mean center and weighted mean center; 2) Understand the definition and use of a population weighted mean center in a GIS environment; 3) Learn how to calculate mean population centers for the USA and for individual states using GIS tools; 4) Understand the magnitude and direction of movement and key reasons why the US population center moved from 1790 to 2010; and 5) Analyze how and key reasons why population centers for individual states moved from 1900 to 2010. Skills include calculating mean centers, selecting and using spatial and attribute data, and symbolizing and querying maps. The investigation of population change and population centers naturally lends itself to discussions of job creation and loss, economic conditions, perceptions of place, the evolution of agribusiness and rural outmigration, urbanization, suburban sprawl, sunbelt migration, changes in the median age, changes from industry to services, international migration to the USA, and a whole host of other issues. Examining the population center for individual states allows students to consider how these issues operate on a state scale. The Census Bureau recently published information on the location of the new 2010 USA center of population, as well as a series of interactive maps showing the 1790-2010 movement, on: http://2010.census.gov/2010census/data/center-of-population.php. Linked to the page is a series of videos from Census Bureau Director Robert Groves who discusses the movement of the population center. These interactive maps and videos provide excellent supplementary materials to the ArcGIS-based lesson. How might you use this lesson to teach about the many economic, political, demographic, and perceptual forces operating over the decades?